Contains samples of Chicago (2) - Street Player from 1979. The track intro is a spoken word sample from a speech of Reverend C.L. Franklin. A longer sample of this speech was famously used by Green Velvet - Preacher Man (The Remixes). The famous line "These sounds fall into my mind" actually reads "Street sounds swirling through my mind". One slick piece of house right here... with intro beats long enough you can make a cup of coffee - the trumpet groove & melody finally kicks in... Very catchy & a track that is easy to mix with it's clear beats. Some people will say a bit too mainstream but it's well produced & has lasted well. 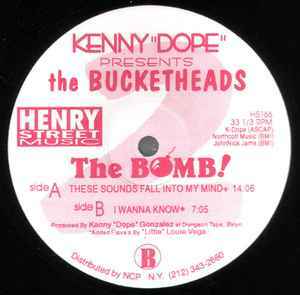 Kenny Dope knows his stuff. It's just a CD lodged onto a circular plastic holder attached to the centre of the vinyl sleeve. I found it in the vinyl section inbetween actual vinyl. Some before might have thought there's no record inside the sleeve so they left it haha. Bit of trivia for you - Guy Ritchie directed the official video for this. Always obsessed over this track in its full length, but I'm a huge fan of the extremely useful Radio Edit as well. Probably the best and most efficient structure I've ever seen in a dance music radio edit: in a 3+ minute duration they seemed to have not only combined just enough of all the elements that made the full length version so great, but you also get a couple added treats as well: namely the instantly recognizable intro with a nice left/right stereo bounce & stutter effect which is a nice touch - and a couple more horn samples from Street Player that aren't in the full 14 minute version. Best House song from 1995, imho! ...and still a blast! This record DOES NOT contain the voice of Reverend Franklin. It is Reverend Trotter sampled from Green Velvet 'Preacherman'. Apparently, incredibly long intro was a mistake in the studio from Kenny Dope which after hearing it back, he decided to leave in. Classic track and a perfect example of how to rework a record - in this case Street Player! weapon! headfuck deep tribal pagan house! . Sampled from the Chicago song Street Player! Both great songs!